Statistics show that 69% of adults, ages 35 to 44, have lost at least one permanent tooth (AAOMS). Dental implants are a permanent and appealing solution to replacing a missing tooth. 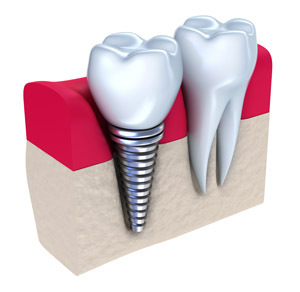 Essentially, implants act as a replacement root, and provides a stable and attractive substitute for a missing tooth. An implant is better than other alternatives-like bridges-because no additional teeth need to be altered to place the new tooth. After an initial consultation with our staff, we will create a customized treatment plan detailing the procedures in creating your implant. During the procedure, we will make sure you are as comfortable and informed as possible. If you do need to have your teeth replaced, take comfort that Oasis Dental has the experience and skill to properly install your dental implants, and give you the confidence to smile again.